Observations of the sun in white light with a small telescope (avoid eye damage by projecting the image on a piece of paper) shows two kinds of structures on the solar disk: dark sunspots and bright faculae (plural of facula - latin for "small torch"). The latter are easily seen towards the solar limb but become hard to discern towards the centre of the solar disk. There, large telescopes instead show tiny bright points dubbed facular points, which are too small and have too low contrast to produce significant contributions to the overall local intensity. Faculae were shown to be associated with strong magnetic fields nearly 40 years ago and a plausible physical explanation for them was proposed by Spruit already in his 1976 and 1977 papers. Interest in faculae increased with the discovery that the total solar irradiance increases when the sun is more active, which may be contrary to expectations since high activity also means more dark sunspots. This is because the bright solar faculae, the number of which are directly related to sunspot activity, increase radiance more than the blocking due to sunspots. However, direct verification of Spruit's model was difficult because faculae remained poorly resolved even with the best solar telescopes until recently. Sunspots and faculae modulate the total solar energy output and they are thus relevant for studies of climate change. A recent article in Nature by Foukal et al. reviews the situation. 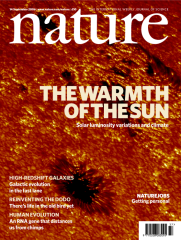 That issue of Nature has an SST image (observer Dan Kiselman, ISP, see top left image, click for the original image) of spots and faculae on its cover, thus highlighting the importance of this telescope in the quest for understanding these solar phenomenae. Several movies have been produced from SST data, showing the dynamics of faculae. A couple of movies by Bart De Pontieu et al. (2006) show a large field with faculae and pores [2.8 MB mpeg], [27 MB mpeg], [10.2 MB mpeg, 200 MB quicktime], [10.2 MB mpeg, 200 MB quicktime]. Another movie, by Luc Rouppe van der Voort (Institute of Theoretical Astrophysics, Oslo), shows a smaller field, including a small sunspot with light bridges [4.5 MB mpeg, 7.8 MB mpeg]. Observations with the SST close to the limb (See image to the left, observer Göran Scharmer, Institute for Solar Physics (ISP)) for the first time demonstrated that the solar surface is not flat but a 3D structure with "hills" and "valleys" directly associated with solar granules, the tops of giant convection cells in the solar atmosphere Lites et al. (2003) used a subfield to measure the depression of an umbra compared to one of the light bridges. In between some of the granules, strong brightenings are obvious. These are solar faculae, seen at high spatial resolution. 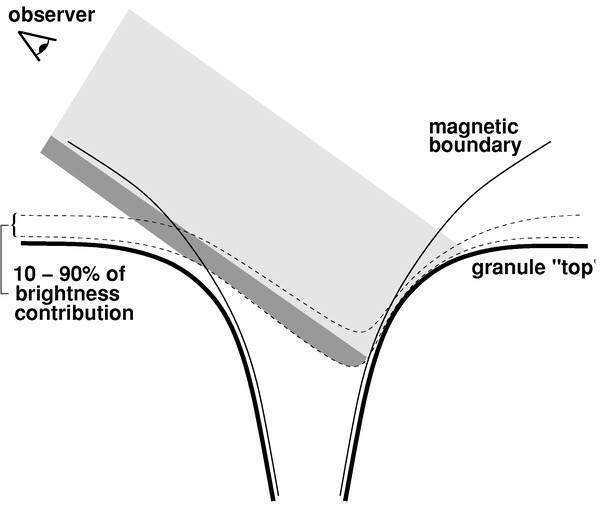 The brightenings may be suggestive of a localized heat source, but actually the explanation to the brighetenings is that the density of the gas is strongly reduced by the presence of strong magnetic fields. The low density of that gas makes it nearly transparent, such that we can see the deeper layers of the granule on the limb-side of the magnetic field concentration. At these deeper layers, the gas is hotter and radiates more strongly, explaining the brightening. The observations were quickly followed by detailed theoretical verifications through numerical simulations. Three groups independently reproduced the observations qualitatively. To the right, from Carlsson et al. (2004), there is a small subfield of Scharmer's image above and an image montage. The latter shows synthetic observations from different viewing angles. Note the similarity between the observed image and the second image from the top in the montage, both from the same approximate viewing angle, θ=53° (μ=cos(θ)=0.6). There is also a movie that shows how a couple of the tiles in the montage develop over time [2.5 MB mpeg2, 4.2 MB mpeg1, 11.4 MB quicktime]. Keller et al. (2004) explained the geometry of the faculae, see sketch to the left. The explaination is essentailly that proposed by Spruit, but the simulations demonstrate that this configuration remains valid in the continuously changing environment of a strongly dynamic, convecting solar atmosphere. T. E. Berger, L. Rouppe van der Voort, & M. G. Löfdahl. Contrast analysis of solar faculae and magnetic bright points, Astrophysical Journal, 661:1272, 2007. M. Carlsson, R. F. Stein, Å. Nordlund, and G. B. Scharmer. "Observational manifestations of solar magneto-convection - center-to-limb variation", Astrophysical Journal, 610:L137-L140, 2004. B. 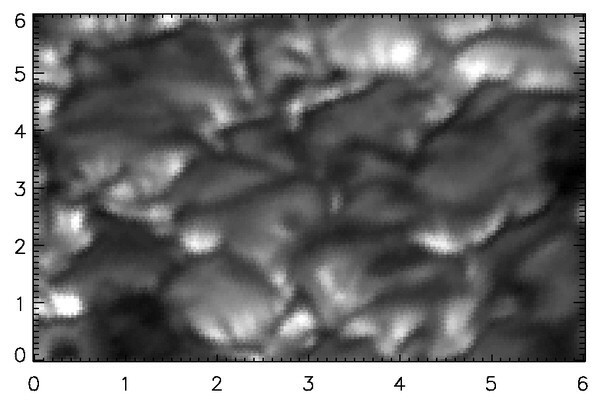 De Pontieu, M. Carlsson, R. Stein, L. Rouppe van der Voort, M. Löfdahl, M. van Noort, Å. Nordlund, G. Scharmer, "Rapid Temporal Variability of Faculae: High-Resolution Observations and Modeling", Astrophysical Journal, 646:1405, 2006. P. Foukal, C. Fröhlich, H. Spruit and T. M. L. Wigley, "Variations in solar luminosity and their effect on the Earth's climate", Nature, 443:161-166, 2006. C. U. Keller, M. Schüssler, A. Vögler, and V. Zakharov. "On the origin of solar faculae", Astrophysical Journal, 607(1):L59-L62, 2004. B. W. Lites, G. B. Scharmer, T. E. Berger, and A. M. Title. "Three-dimensional structure of the active region photosphere as revealed by high angular resolution", Solar Physics, 221(1):65-84, 2004. The sketch and the black-and-white images should be credited to the authors of the articles from which they were taken. The copyrights belong to the journals, as does the copyright of the cover from Nature. All other images and movies found here are free for publication provided that proper credits are given. They were all collected with the Swedish 1-m Solar Telescope (SST). The SST is operated on the island of La Palma by the Institute for Solar Physics of the Royal Swedish Academy of Sciences in the Spanish Observatorio del Roque de los Muchachos of the Instituto de Astrofísica de Canarias. Observers come from our own staff as well as from many visiting groups. Please credit the Royal Swedish Academy of Sciences as well as the observers for the individual images. Here is the name of the academy in a couple of languages: Swedish: Kungl. Vetenskapsakademien. German: Die Königlich Schwedische Akademie der Wissenschaften. French: L'Académie Royale des Sciences de Suède. Spanish: Real Academia de Ciencias de Suecia. More images and movies from the SST can be found in our Gallery.